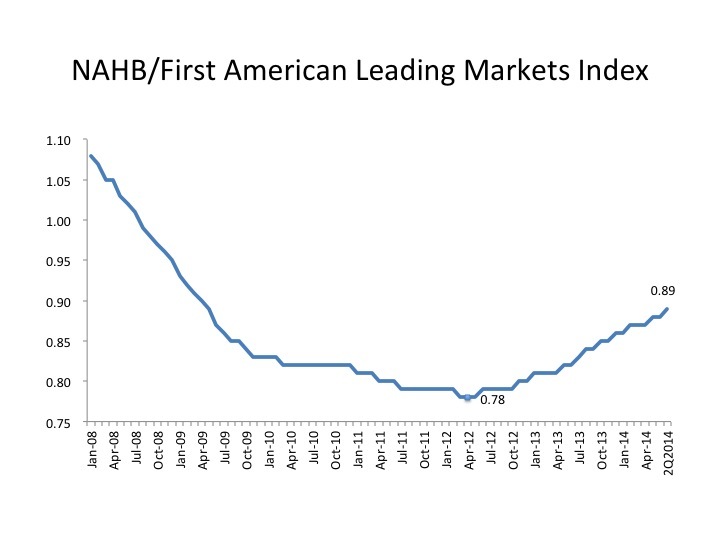 The NAHB/First American Leading Markets Index advanced one point in the second quarter 2014 to .89 from a June level of .88. The index measures the US and 351 metropolitan markets’ proximity to normal economic and housing market activity. A value of one or more means the market is back to or above a normal level with an average of three components at or above one: single-family housing permits in the past 12 months compared to their annual averages in 2000-2003, house prices in the past 12 months compared to their annual levels during the same period and employment levels in the past 12 months compared to their annual level in 2007. Over one-third (36%) of the 351 metropolitan areas measured improvement since June (the index was reported monthly up through June 2014 but will henceforth be a quarterly index reported the fourth business day of the second month following the end of the quarter) and 78% of them improved since August 2014. At the national level, the only one of the three components that improved since June was home prices rising to 1.27 from 1.26 as home prices in 323 markets (or 92%) are at or above their 2000-2003 averages. A much smaller share (46 markets or 13%) showed more people working in the past year than at the peak in 2007. The component showing the least recovery continues to be single-family permits where only 22 markets (6%) issued the same or more permits in the past 12 months as the annual average in 2000-2003.